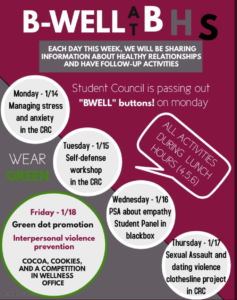 This week, Barrington High School is hosting a series of events focused on healthy relationships designed to increase awareness and start vital conversations. Parents also play a role in these important conversations with their child. Here are some helpful tips to guide you. Name It – What is the problem, complaint or the thing you don’t want? Flip it – What is the positive opposite (or the thing that you do want)? Frame it – What is the positive impact if the flip is true (or the desired outcome)? Here’s how you can use this strategy with the topics discussed this week at Barrington High School. Name it – While anxiety is normal and can serve as motivation, too much anxiety can interfere with our ability to think and function. We don’t want our anxiety to hinder our ability to function and do our best thinking. Flip it – We want to tackle the stressors in our life with positive coping strategies. Anxiety is real and there are many resources and strategies to help teens struggling with this issue. The National Alliance on Mental Illness provides lots of great resources related to anxiety that can be found here. For more about teen stress and tips to help your student manage stress, visit the BStrong Together webpage Stress. Name it – Domestic violence can happen anywhere and often the victims remain silent. Dating violence and sexual assault are also real issues effecting today’s teens. Flip it – Speak up and speak out against violence whether it is domestic, dating or sexual. "What are your expectations for how a partner treats you?" For more information about domestic violence, visit the United States Department of Justice. Name it – Teens often get a bad rap of lacking empathy, but with modeling and teaching, teens can develop empathetic skills. Flip it – We want our teens to care about others and express empathy. This brief article shares some insight into how to develop empathy in teens and shares some great scripts for having conversations with your teen that model and develop empathy. And remember, there are lots of supports for students and parents in the community. The Wellness Office was created this year with the goal to empower students to be happy and healthy. A variety of supports are offered in the Wellness Office including various groups and workshops. Additionally, the office allows a space for students to take a break if needed during the school day and has staff available to help students process situations if needed. Please feel free to contact any of the Wellness Staff members; Kevin Art, Allie Bauer, Sarah Kirkorsky, Pat Radke and Amy Winkelman should you have any questions or student concerns! Do you want more support in building your relationship with your teen? BStrong Together is committed to enhancing the mind, body and spirit of Barrington youth and the parent/child relationship is at the core of the mission. Check out the BStrong Together website for lots of great resources and events or join one of their monthly conversation circles designed to build a community of support around today’s parenting struggles and joys. There is still room in the High School Conversation Circles. Click here for more information or to register to join. Dr. Cheryl Peterson is a Barrington resident. She has a seventh and ninth grade student in the Barrington Schools. She holds a Doctorate degree in Curriculum and Instruction from the University of Minnesota. For the last 25 years she has taught a multitude of grade levels and held instructional coaching and leadership roles in Illinois, Iowa and Minnesota. She is also a member of the BStrong Together Programming Committee and volunteer. Currently, she is exploring opportunities as an educational entrepreneur at https://explore-ideasconsulting.com.